The Severn Estuary area is here taken to be that as defined by the Severn Estuary Partnership, and runs from just above Gloucester, south west to Lantwit Major on the South Wales coast, and Minehead on the North Devon coast. The Estuary is estimated to be 557 sq km, roughly 18 % of which is intertidal (100 sq km). (Intertidal areas are those which are covered by the sea at high tide and exposed at low tide). Much of the intertidal area runs along the estuary shoreline which is estimated to be 370 km in length. This is accessible for much of its length (determining this figure will be a project outcome) as are the sea walls which line much of the estuary. Approximately 80 % of the estuary’s 370 km shoreline is lined with these sea walls which are regular, grassed earth banks in rural locations and concrete walls in ports and towns . These are often used for walking, bird watching, ‘tide watching’, accessing the foreshore for recreation. These stop the very highest tides flooding low lying surrounding land, thus marking the upper limit of the intertidal areas and forming their “immediate landward margins”. Increase local/community stake in decision-making about the estuaries future as a whole and locally. The estuary has the highest tidal range in Europe and the second highest in the world. The large intertidal area results from this high tidal range in combination with other geomorphological characteristics. The tides and intertidal areas are a fundamental and unifying feature of this area’s landscape character. They are extraordinary visual spectacles in themselves and the intertidal areas and margins are home to a rich combination of internationally important natural and culture heritage (this is detailed below). Some 3,000,000 people live around the estuary in large urban conurbations (Cardiff, Newport, Gloucester, Bristol); smaller towns (Weston, Cleveland, Chepstow) , and remote rural settlements which are set in open, rich, agricultural land. It is worth noting that the other coastal areas in the world with comparable tidal ranges are in remote rural landscapes (e.g. in Canada and Russia), so the Severn Estuary is the most tidally dynamic estuary in the world which is also close to large population centres. At present, areas such as the Bay of Fundy (Canada) make a great deal of their tides in terms of local character and tourist attraction, very little is done in relation the Severn Estuary’s equally amazing tidal landscape. (Apart from attention being paid to the famous Severn Bore). It should be noted from the outset that the estuary’s intertidal areas vary greatly in a number of respects. They vary between inaccessible mud / sand banks and channels only exposed at the very lowest tides, to accessible areas of beach, rocky foreshore, and salt marsh meadows which are only flooded at the very highest tides. All these areas are interconnected as a living landscape through a range of means which include the visual, physical processes, and very high ecological and other heritage values (see below). Although some areas of the landscape are remote and hard/impossible to access, it must be stressed that this is a uniquely public landscape (in part because of it visual openness) and because of the open access to the coast/foreshore in many places. Created by the relational movement of earth, sun and moon, the semi-diurnal tides (rising and falling roughly twice every 24 hours) have complex daily, monthly and seasonal rhythms. At the very highest tides (perigee spring tides) which occur at the equinoxes, the sea level can rise and fall by as much as 14.5 metres in the space of 12 hours. That is the sea level rising 3 times the height of a double-decker bus in 6 hours then receding again. The estuary is dominated by this profound natural process which shapes its physical features, ecology and cultural heritage. The high tides wash up the estuary to create the famous Severn Bore, a tidal wave that runs over 7 miles up the Severn River above Gloucester (making it “the river that sometimes flows backwards”), which attracts tourists, surfers and artists to the river. The times of high and low water slowly migrate across the 24 hour grid, bringing a very different pattern of temporal life and sense of time to the landscape in natural, cultural and economic terms. There are unique, and always varying patterns and rhythms of space/time and related practices of landscape, such as intertidal commercial fishing, livestock farming on salt marshes, work related to ports and coastal trading, and a range of recreational activities (e.g. walking, fishing and bird watching). The tidal processes speak to the aliveness of (the) landscape and the never-ending gravitational pas de trois of earth, sun and moon , and create huge, ever inter-changing vistas of shore, intertidal area, sea, sky, space and light. These are enjoyed by many people, including those who work in relation to the estuary, live or work overlooking the estuary, visit it/use it recreationally, and those who see it in their travels along its shores and over its bridges. The estuary is vital to the local and regional economy being the site of tourist resorts (tourist beaches such as Weston, Barry and Bream Down are part of the intertidal area), large ports, nuclear (and other power stations) and spectacular toll bridges. The landscape is on such a scale, and is so visually dynamic, that these large industrial developments are absorbed into it and it retains a sense of wildness and remoteness, even when in close proximity to the densely populated urban areas. The drama of the tidal areas is the focus of a number of artists writers/poets (e.g. 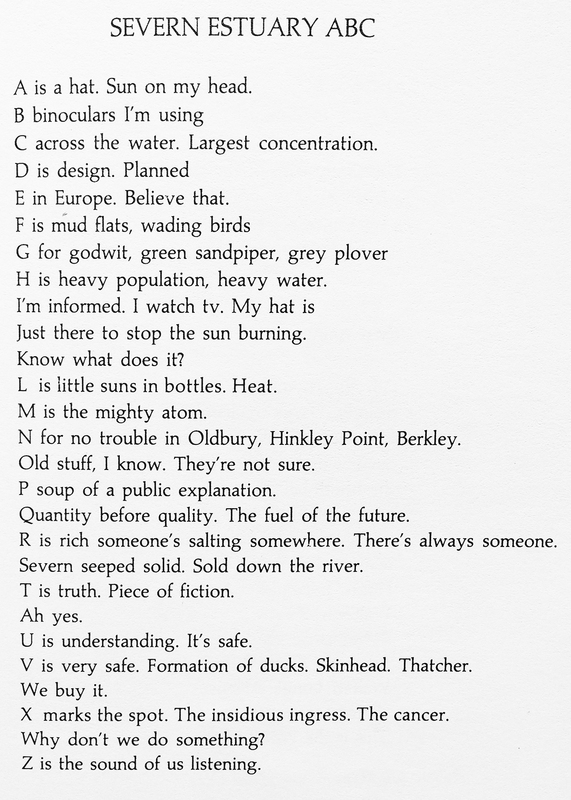 “Water Table” by Philip Gross, winner of the 2010 T. S. Elliot poetry prize; and Alice Oswald’s “Sleepwalk on the Severn”). Inevitably there is a very rich heritage of past social and economic interaction with the tidal landscape. This includes a whole history of ports and tidal harbours, ferries, military defences, rail and road networks, intertidal fishing practices, and very rich archaeological evidence of older associations between society and the tidal estuary. The estuary is also a key site of ecological/biodiversity heritage. These are expanded upon below. • Maritime Heritage. The estuary has a very important maritime heritage both of international and local trade through the ports, harbours and craft associated with them. Two very famous and distinctive types of craft evolved to work the tidal waters of the estuary. The Severn pilot cutter was built to cope with the fast, turbulent tidal waters of the estuary, and the Severn trow for coastal trading out of small inter-tidal creeks and harbours. The tidal waterways of the estuary have made some of the largest and most important ports in UK (e.g. Cardiff, Bristol) which are bound up with stories of international trade and empire. Many small tidal harbours also existed. Some remain (e.g. Lydney), though many are now ‘lost harbours’. Other built heritage remains are evident around the margins of the estuary’s intertidal areas. For example, coastal navigation features, (e.g. huge abandoned fog horns); the hulks of many traditional Severn craft which can be found at the famous ‘boat graveyard’ at Purton, Gloucestershire, which has been described as one of the most important marine archaeology sites in the UK; and the slipways and jetties of tidal ferries (see below). • Other Transport and Military Heritage. There is an equally rich local/ regional heritage of terrestrial transport networks in the forms of ferries, railway tunnels, bridges and swing/transporter bridges which have resulted from the need to travel across and around the estuary as efficiently as possible. For centuries a series of ferries were the only means of crossing the estuary and these have left a built heritage around the margins of the intertidal areas (e.g. wooden jetties, old stone slipways) many of which are now abandoned. These ferries crossings (which had their own small fleets of boats and associated boarding houses) and the timings they operated to, were shaped by the tidal rhythms. They were gradually replaced by firstly the Severn Railway Tunnel (1886) and then the two vast Severn road bridges which were opened in 1966 and 1996. These developments have transformed the way local populations move around and across the estuary. In many senses they have removed the intimate contact the ferries would have given passengers to the tidal landscapes, but the views from the Severn Bridges have at least opened up other vistas. Given the strategic importance of the estuary there is also a military heritage around its margins, particularly from the 19 century and second world war. Much of this is very much at risk due to a lack of upkeep, for example the searchlight stations on the island of Flatholm which formed part of the air defences of the estuary’s ports. • Unique traditions of fishing and agriculture. A range of traditional harvesting practices have grown up in association with the inter-tidal areas and their margins. The most significant of these are a set unique fishing techniques which include:- lathe net fishing (which is done by wading in the incoming tidal stream); long net fishing from small boats; intertidal fish weirs (where willow traps are placed at low tide and checked at the next low tide) (all aimed primarily at catching salmon migrating up the estuary to breed and spawn in the rivers); ‘mudhorses’ (a sort of sleigh used to move across the more treacherous and remote mud banks in order to gather shellfish) and a strong and lucrative tradition of netting for elvers (immature eels). Line fishing from intertidal margins remains a important recreational activity and is done in conjunction with tide times. (Agricultural Heritage). Marshy intertidal areas around the estuary were first settled thousands of years ago, as demonstrated by archaeological finds of walkways across the Somerset Levels. The rich land around the estuary was gradually reclaimed for farming and settlement. The way of life of livestock grazing (mainly sheep & cattle) on the estuary’s hinterland has produced distinctive local products (e.g. salt marsh lamb). The lowland wet grazing marsh and adjacent salt-marshes are now also managed for nature conservation purposes alongside agricultural usage. • Archaeological heritage. Given the above traditions it is not surprising that the estuary is an internationally important area for archaeology. The intertidal areas contain significant relics of ancient subsistence agriculture and settlement. Consequently an archaeological research group, “The Severn Estuary Levels Research Committee” has been established at Reading University to focus on this heritage. The dynamic, and in some ways fragile environment of mud flats and sand banks, shifting river channels and soft shore line makes this heritage particularly vulnerable to both human and naturally induced change (see below). • Recreational heritage. The intertidal areas and their margins host a wide range of recreational activities such as walking, tide watching, bird watching, fishing, beach sailing, tourist beaches – and more modern activities such as jet skiing and surfing the Severn Bore. The beaches and piers of Weston-Super-Mare, Clevedon and Barry are classic British seaside holiday spaces and very much part of the estuary’s heritage and landscape. Some ‘lost’ recreational heritage exits such as abandoned lidos and derelict piers (Severn Beach). In some places the intertidal / foreshore areas are easily accessed (both through formal and informal provision) and used on a daily basis for a range of activities. But in many other areas there are a limited number of slipways and moorings compared to many other UK estuaries. Public access to safe areas of the intertidal zone, and supporting interpretation of it, is lacking. Consequently, overall, there is limited interpretation and therefore public awareness of the value of the estuary and its unique, internationally valuable tidal landscape. Natural England has identified the Severn Estuary as one of the 24 UK Maritime Natural Areas because of the tides and the effects these have on natural heritage and on geological and geomorphological features. The Wildlife Trusts (2010) say that ‘the vast tidal range of the Severn Estuary makes it one of the great natural wonders of the world’, and that ‘the estuary’s fast flowing, silty water has, over thousands of years, created an ecosystem unlike any other in the UK’. The estuary’s intertidal areas provide some of the most important habitat for wading birds in Europe. They support some 200,000 migratory wading birds each year and are consequently protected under a whole range of high level national and international conservation designations. They are a key focus for a number of significant conservation and education bodies such as the RSPB, the Wildfowl and Wetland Trust, and The County Wildlife Trusts. The ecology of the estuary can be considered in aquatic, intertidal and littoral/terrestrial areas. The waters of the estuary have a complex aquatic biodiversity which is shaped by the brackish nature of the estuary waters (i.e. a mixture of fresh water from the rivers and salt water from the sea). It is constantly being mixed in differing patterns by the tides. The fast flow of the tides also means a vast amount of silt is suspended in and moved about by the estuary’s waters. The mosaic of intertidal areas has a biodiversity to rival any ecosystem, including tropical rainforest and mangrove swamps, this including the bird life that feeds on the rich mudflat ecology. The landward margins of saltmarsh and lowland grazing marsh have unique, littoral and terrestrial ecologies of plant and animal life which vary according to the frequency of tidal inundation. All three of these habitats: estuary water, inter-tidal areas and littoral margins are interdependent. Pressure or impacts on one habitat (such as pollution in water or development over salt marsh) can affect the ecology of other habitats. In summary, the combination of all the above means that the estuary and its intertidal areas has a very strong sense of place which is keenly felt by many of those who live around its shores, particularly for smaller communities, and those whose work and/or recreational practices are still linked to the tidal landscape. It should also be noted that while the tidal estuary forms a very distinct landscape in itself, it is also inextricably linked to the entire Severn River – Britain’s longest and ‘wildest’ river – and other important rivers such as the Wye, Avon, Usk, and Taff which drain also into the estuary and all of which are tidal in their lower reaches. Thus the ‘health’ of this estuarine landscape underpins that of some of the UK’s most important rivers. Many of the traditional practices and the crafts associated with the estuary, such as boat building and repairing, ferrying and navigation , and those associated with the local forms of fishing/agriculture have declined to vestiges kept up by a few practitioners and enthusiasts . Barker (2008) suggests that many of 3 million people who live around the estuary (especially those in large conurbations) have ‘lost touch’ with the tidal/estuarine landscape. This leaves those who do access the estuary shoreline and intertidal areas as a passionate minority. Intertidal areas are often taken-for-granted by the public and even planning authorities in the Uk and beyond. They can be regarded as ‘empty’ and even ugly, and thus are at risk of neglect, abuse and/or development, even if they are under nature conservation designation. For example the Taff Estuary intertidal areas in Cardiff (which adjoined the Severn Estuary) have been permanently flooded to create Cardiff Bay for the purposes of urban regeneration, even though they formed a Site of Special Scientific Interest, and a very distinctive, locally vibrant wild landscape in the heart of this large city. Because of this, and other reasons, the tidal Severn estuary and river faces an unprecedented level of threat and uncertainty in regard to both its natural and cultural heritage on a range of spatial and temporal scales. Professor Simon Haslett, a leading expert in the estuary’s archaeology, has recently written that the heritage resource is under a significant threat of loss. A complex set of sometimes conflicting demands is placed upon the tidal estuary, for example between recreational use, resource extraction, nature conservation, waste discharge, agriculture (grazing of salt marshes), transport needs, coastal management and development and public access. Risks to the landscape include; coastal development for housing, transport, industry and power generation (two very large developments are currently being considered – a large expansion of Royal Portbury Docks and the build of a third nuclear power station at Hinkley Point); pressure on natural systems (e.g. pollution / water quality), aquatic biodiversity decline (e.g. salmon and eels); resource extraction (e.g. dredging of building aggregates); and perhaps most significantly the possibility of major tidal power generation schemes which might involve a barrage; and the potential impact of climate change through sea level rise. As might be obvious by now, we are quite into lists of books, art works, and other things. Listing might be a male, slightly ocd type thing – but as discussed with Bettina – it is also an expression of care/love, and an expression of care/love about other people’s care/love. This needs updating, but here is a list of books/phamlets about the Severn Estuary.